A great set for collectors who will appreciate the exclusive minifigures and for kids who will enjoy the action features in the set. Recommended. LEGO Duel on Geonosis 75017 is part of the Summer Wave of Lego Star Wars Sets 2013. Unlike most other sets in this wave, Duel on Geonosis is largely original, with only certain components having been released in a previous set. The set recreates an action sequence from the movie Star Wars Episode Two: Attack Of The Clones where Separatist leader (and former Jedi) Count Dooku and his former Master, Yoda are fighting on Geonosis. Both characters appear in minifigure form in the set and the setting is also recreated. Other highlights of the set include a Poggle The Lesser figure (leader of the Geonosians), Count Dooku’s Solar Sailor Pilot as well as his speeder bike and a printed tile featuring the Death Star plans. Given that all minifigures are unique to this set and it also includes the printed Death Star piece, this is an attractive set for collectors. For kids, the playability is high too, with the four minifigures, one vehicle and a playset with a number of action features so kids who are familiar with the movies or the characters (from the Clone wars TV Series) will like LEGO Duel on Geonosis. 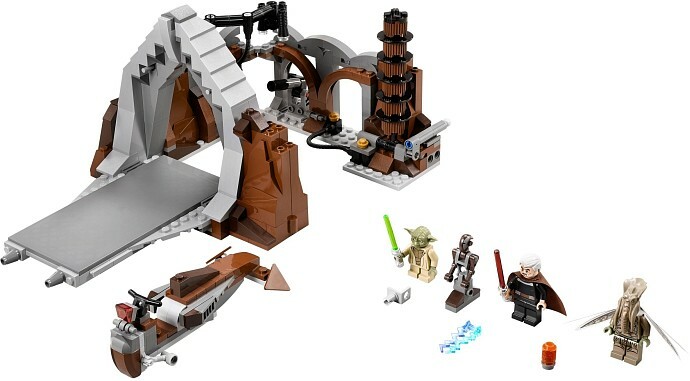 Note: There are a number of LEGO sets coming out in this Summer 2013 wave that are based on Star Wars Attack Of the Clones, and this set would go particularly well with the LEGO 2013 Republic Gunship, as it is also based on this moment in the movie and contains a number of complementary minifigures.